Word uses the last-used zoom factor setting when opening a new document. For instance, if you had enlarged the last document to 300 percent, the new one will also be zoomed in with this factor. Many users, however, prefer it when the text processor always opens new documents in a pre-defined scale. To achieve this, you must modify the global template for new Word documents. Under Word XP and 2003, it is the ‘Normal.dot’ fi le and in Word 2007, it is ‘Normal.dotm’. Close the text processor and search for the template of the suitable Word version (see note). Right-click it and select the ‘Open’ context command. Word then starts the global template, which you can now ‘Edit’. It is necessary that you use the ‘Open’ command from the context menu, because if you activate the global template by double-clicking, Word creates a normal document based on the template. In the older text processor versions, you can specify the zoom factor through a combination box in the ‘Standard’ toolbar. In Word 2007, use the slider on the lower right border of the program window. The mouse trick also functions in all versions: keep the [Ctrl] key pressed and scroll forward or backward with the mouse to zoom in or zoom out respectively. In order to make sure that Word saves the template and the zoom factor modification, enter any text – a single letter is also sufficient. 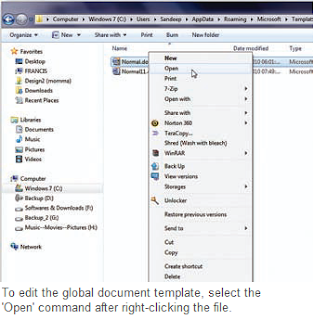 Then click ‘File | Save’ or in Word 2007, click the Office button and then ‘Save’. Then remove the text and save the file again as an empty template. Close Word with ‘File | Close’ or in the 2007 version, through the Office button using ‘Close Word’. Note: You will normally find both these fi les in this location ‘C:\Users\[Username]\AppData\Roaming\Microsoft\Templates’.